Our National Scenic Trail system is not finished. There are both internal and external gaps, and Jim Kern wants to close those gaps. At 83, this trail legend continues to work tirelessly to make our trails truly continuous footpaths as they were envisioned in the original 1968 legislation that created them. His web site Hiking Trails for America was set up to spearhead his efforts. By visiting that page, you can help. I urge you to go there and sign the petition. Jim's work started even before the National Trails System came into being. He is a true trail blazer. In 1966 he founded the Florida Trail, lamenting the fact that he had to drive from his Florida home to North Carolina to do the sort of uninterrupted long-distance hiking that he and so many of us love to do. You can find a great summary of his ongoing advocacy efforts in this Tampa Bay Times article. The problem that Jim highlights, of which I want to raise awareness in this post, is that legislators have not given the National Trails System the same status that they routinely give our National Highway system--the ability/authority to close those gaps by acquiring land from private owners for the good of the public. We have the ability to strangle the nation in a web of bulldozed, manicured concrete ribbons, but not the ability to preserve purely wild ecological corridors of protected land where the forces of nature can operate unconstrained. It has long been known that a healthy ecosystem cannot be split into isolated patches. The inhabitants must be free to roam. See this Wikipedia article for a pretty objective discussion of ecological corridors, including both pros and some of the practical limitations. The worst of the limitations apply to the most reclusive animals, usually the big ones, and don't so much apply to hiking trails, and to the natural trailside plant life. Eminent domain, as it is called, has its controversial social elements too. Who hasn't read about the cases of a little old lady refusing to sell her house so that an urban freeway can be pushed through, sending eight lanes of screaming traffic from A to B at sixty miles per hour. There have been too many publicized cases where that little old lady was booted out by force. When the Appalachian Trail corridor was pushed through eastern Tennessee using Eminent Domain many years ago, the feds used their authority with a heavy hand, and locals, not trusting of government even before the land was seized, have been slow to forget this intrusion. See this thread on White Blaze for a thorough discussion of the problem. If we are to make eminent domain work, I believe we need to build a super-patient, long term design into the process. Let anyone who will not sell keep their land as long as they live, and even allow them to bequeath it to their named heirs. The law can be written such that no unborn (and thus not-yet-existing) person can inherit land in the designated trail corridor. Before the heirs even take possession, they will already know that their land is designated as a nature preserve and will revert to public ownership when they pass on. They know that they can 'cash out' at any time at a fair, negotiated price; and they know that if they choose not to sell, that their designated heirs will inherit the cash value of the property at a fair, negotiated price. Hiking Trails for America (HTA) is particularly concerned about the fate of our 11 National Scenic Trails. This concern is timely because this year is the 50th anniversary of the 1968 National Trail System Act. The Act did two things. It enabled all the rights-of-way to be acquired to preserve the Appalachian Trail. In ’68 two-thirds of the A.T. existed on federal land. The remaining 700 miles was still on private property in a large number of discontinuous pieces. Chuck Sloan, on the board of the A.T. Conference in the ‘60s, said that at every quarterly board meeting there were any number of trail relocations required. If the trail was of value, it needed permanent protection. The other reason for the Act was to establish a National Trails System so that other significant, long trails could be added to the A.T. and granted the designation of a National Scenic Trail. The Pacific Crest Trail was the first to be added. My own Florida Trail was added in 1983. 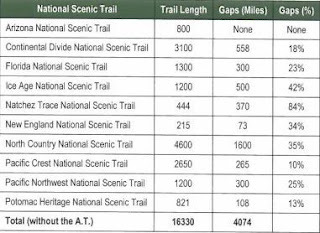 None of the 10 trails that have been added in the past 50 years received the taking authority that the A.T. received and all have gaps, hundreds of miles of gaps. The gaps can be categorized in two ways. They can be sections of trail open to the public now, but simply not secure for posterity. Or they can be gaps not hikeable today, requiring a hiker to get out on the road and hike to the next secure stretch of trail. These gaps are extensive. In fact, I have added below a chart that lists all 10 trails and the gaps in each of them. 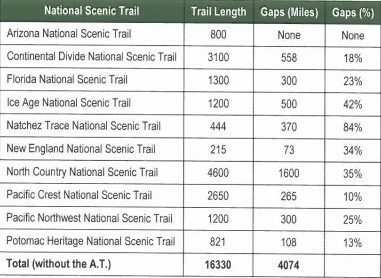 You can see that these gaps represent a staggering 25% of the total: about 16,000 miles of trail alignment in these 10 trails and 4,074 miles of gaps. Many good friends in the hiking community think these gaps can be closed over time through public and private partnerships. Our position at HTA is that this task is insurmountable. These 10 trails need the legislation that has preserved the A.T. If Congress didn’t think that eminent domain was needed to acquire 700 miles of the A.T., they never would have included it in the ’68 legislation in the first place. You can be sure of that. Here are some figures given to us by the US Park Service in Martinsburg, West Virginia, that handles acquiring right-of-way authorized by Congress. From Springer Mountain in Georgia to Mount Katahdin in Maine, there were about 2,550 separate parcels that had to be acquired. Of these, the taking authority (provided for in the US Constitution) was required for about 400 acquisitions. The interesting thing is that in most of these, eminent domain was only needed to settle title issues. Acreages away from population centers are often in individual ownerships for many years and are handed down from generation to generation. During that time, it is common for titles to get clouded, so that in a taking a court has the task of figuring out to whom the compensation will be paid. About 100 of the 400 cases were adversarial, i.e. the owner resisted the taking. You can see therefore that there was one adversarial taking in 25 acquisitions that were contentious. This taking authority is a gross intrusion into the life of any citizen who owns private property and does not want to sell it. It’s easy to see why this taking authority is controversial. On the upside, about 3 million people will set foot on the A.T this year. Over 4,000 backpackers will make their way to Amicalola Falls State Park this spring to begin a 2,180 hike to Mount Katahdin. The A.T. is so iconic and popular that, even though the acquisition process was only completed in the last 5 years, there are overuse issues up and down the trail. No other trail begins to have the use densities of the A.T. One reason is the population density of the northeast. Certainly, another is that the other 10 are not continuous. Roadwalks can be dangerous, hot, and boring. A good example of a trail club making advances in acquiring right-of-way is the Pacific Crest Trail Association. In the last couple of years they have acquired several parcels in an effort to stitch together their trail gaps. But the process is highly inefficient. They must often buy far more than they need to acquire a short stretch of trail because that’s what the owner has for sale. Even worse, they can find in buying a piece within the alignment approved by Congress that the adjacent owner has now decided he doesn’t want the trail on his property. And so the purchase just made is now surplus land, a costly development where those who authorized it are now criticized. This has happened to us on the Florida Trail. While eminent domain is a delicate subject, it is all around us. I have invested all my life in Florida land. Right now, the State of Florida is exercising its taking authority on our land with road frontage near the Jacksonville Airport because the road is being converted from two lanes to a divided four lane highway. I have body work done on my cars at a convenient location near my home that is adjacent to the St. Augustine Airport. They are taking the owner’s house and garage because the Airport is expanding. 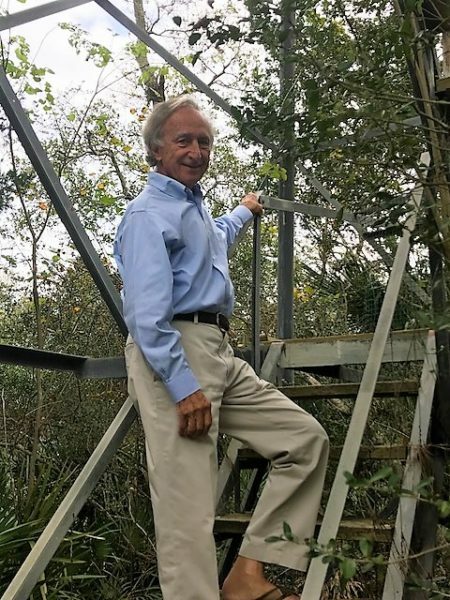 Years ago, while I was the general partner on a 2,000 acre tract, the Florida Power and Light Company came through the center of our property with a 160 ft. wide easement to extend its service westward. Every long, thin corridor like a highway, railroad, power line, gas line, and canal must have eminent domain. Note that the above are all utilities. But schools need the taking authority as do fire stations. The Constitution states that there must be a public need. Does outdoor recreation fit this requirement? Yes, it fits this requirement. But there is only one kind of outdoor recreation that needs the taking authority. If you want a state park on a scenic river and you can’t purchase your first choice because the owner doesn’t want to sell, keep looking up and down the river. Over time, you should be able to find a site. Do folks with snow mobiles need a place to use them? The forest service often cooperates in setting aside trails. Of course, all the aquatic sports have no concerns. Most rivers, lakes, and certainly the ocean are navigable. In outdoor recreation hiking trails have a unique need, the same need as utilities, preservation of a long, thin corridor – and it needs to be continuous. The contrast in use between a long, continuous trail, set aside for posterity, and a long trail with hundreds of miles of gaps is dramatic. While the A.T. has over 3 million users in a year, the Florida Trail has about 350,000 users. While over 4,000 hikers seek to hike a much longer A.T. from end-to-end each year, only 12 to 15 set out to hike end-to-end on the Florida Trail. You can’t say that is because the A.T. is well known. It is well known because it is continuous. Consider these two facts. While the A.T. was essentially completed in the 1920s, the Florida Trail is over 50 years old. Furthermore, the Florida Trail is the only long National Scenic Trail free of snow during the winter months. In fact, December to April is our hiking season. Hikers should be coming from all over North America to hike here during those months. Europeans and Asians should be coming here to hike in the winter also. Why aren’t they? The trail is not well known. Why? It’s not safe and secure for posterity, nor is it continuous. The outdoor industry should get behind this issue. The industry is beginning to speak up elsewhere. It spoke up when the President put many National Monuments under review. And it spoke up when the Governor of Utah wanted to see federal land in Utah turned over to the state. These are political and controversial issues, but it is in the interest of the industry to take these positions. And it is certainly in the interest of the industry to close the gaps in our National Scenic Trails. Every company in outdoor recreation should see the benefits of completing our National Scenic Trails. Those that have a huge stake in this issue are not just the manufacturers of lightweight tents, lightweight stoves, lightweight air mattresses, and hiking boots but include companies that make binoculars, sunglasses, outdoor clothing, and kayak paddles, just to name a few. Think about the statistics earlier in this letter. They are overwhelming. Long hiking trails can simply not be completed without the taking authority. Remember this: After the taking no one remembers. One very important thing that the acquiring agency did for the A.T…. they moved slowly. It wasn’t until 1975 that things got rolling. For the next 35 years they patiently and tactfully called on property owners. They always had with them a member of a local hiking club. Jim Snow, retired attorney from the US Forest Service, who took part in the taking process, said that to his knowledge no one was ever asked to leave their home to make way for the trail. Such is not the case with a 400 ft-wide interstate highway taking. The two should not be confused. Hiking trails could not be more democratic. There are used by virtually every age. A couple recently hiked the length of the A.T. with an infant on their back. Grandma Gatewood first hiked the length of the A.T. in 1955 in sneakers. She hiked the entire length two more times, the last when she was 75. We have the benefit of being on the right side of history. America needs these trails. Only one in six American adults is sufficiently active to support good health. Most hikers don’t want to be thru-hikers, but we are encouraged by seeing the treks they take, and we want to emulate them in our own way. Hiking is democratic in another way. Everyone can afford it. Only some proper footwear is required, and everyone owns a pair of sneakers. Good enough for Grandma Gatewood; good enough for us. There are over 37 million hikers in America who take 18 or more outings a year. This is a huge constituency. We need to locate them, which we can do now on social media. But the sums required to do this are beyond the means of a small non-profit. They are not beyond the means of the industry. We know the Congressional districts throughout America that include, on their border or within them, a stretch of National Scenic Trail. With the address of any hiker, we can supply the names of those serving him in Congress, a task that would have been overwhelming just a few years ago. I can’t think of a more important issue in outdoor recreation. In comparing strenuous outdoor activities, running and jogging are first with 18% of the population. Biking is second at 15%. They don’t have trail acquisition problems. Hiking is third with 13%. But hikers tend to be non-confrontational, even passive. They enjoy solitude or companionship with just a few people. Not the kind of personal attributes that would enjoy facing an uphill political issue! But among the 37 million, we can find hikers who will help. I want to take this action because it’s the right thing to do at this point in American life. Don’t be concerned by the size of the task. We’ll get there one step at a time. The stars aligned in 1968. They will align again. Jim's letter so completely and comprehensively expresses my own position that little more needs to be said. I would, however, hope to extend the concepts. We ought to look toward adding connecting trails, developing a continuous network of National Scenic Trails that criss-cross the nation, just as the Interstate Highway System Does. See my post on that subject here. I've also started the Fifty Trail initiative as a means of connecting our National Trail system into one single linear footpath. This is not a short-term effort. Like any long distance hike, it comes down to patience and perseverance. One step at a time, just as Jim says in his concluding line. So join us. Lets get out there and see this trek thru!